Companies are defaulting on their debt like it's 2009. Blame cheap oil. Global corporate defaults exceeded 100 so far this year, according to Standard & Poor's Ratings Services. That's already double the amount of defaults in all of 2014. It also represents the first time the triple-digit default milestone has been crossed since the end of the Great Recession six years ago. The 2015 default list is riddled with energy companies succumbing to the crash in oil prices since last year. Almost one-third of this year's defaults were companies in the oil, gas or energy business, according to S&P. Many of these energy companies piled up on debt when the industry was booming. Now that crude is sitting at just $40 a barrel, down from over $100 last year, these companies are struggling to pay back their debt. "It makes perfect sense. A lot of debt plus lower prices equals financial stress. Everyone thought oil would stay over $100 a barrel forever -- and then it didn't," said Nicholas Colas, chief market strategist at ConvergEx. Most of the energy defaults were by U.S. companies, which are particularly susceptible to lower prices because of the relatively high cost to produce oil here. The pain appears to be intensifying, as evidenced by the fact that many of the defaults have occurred in the past few months. For instance, just since the end of August, S&P said the following oil and gas companies have defaulted: SAExploration Holdings (SAEX), Halcon Resources (HK), Goodrich Petroleum (GDP), SandRidge Energy (SD), EXCO Resources (XCO) and Vantage Drilling (VTGDF). "Energy companies are really taking it on the chin. All of a sudden the economics have just completely changed," said Douglas Baird, a University of Chicago Law School professor who is focused on bankruptcies. Of course, it's not just oil companies. Some consumer brands have defaulted amid bankruptcy filings, including once-iconic retailer RadioShack and apparel makers American Apparel (APPCQ) and Quicksilver. Emerging market defaults have also increased dramatically this year. That could continue to be a problem because the U.S. dollar has soared against rival currencies, especially in emerging markets like Brazil. A super-strong U.S. dollar makes it more difficult for foreign companies to pay back debt they took on that was priced in dollars. It's important to note that the number of defaults remains well below the Great Recession peak of 268. Also, the percentage of U.S. companies defaulting on debt is relatively low at just 2.8%, according to S&P. That's below the long-term average of 4.5%. Still, Diane Vazza, head of S&P's global fixed income research team, said default rates are "creeping higher." That's despite the fact that interest rates remain extremely low, keeping borrowing costs relatively cheap. "It's a wake-up call to the market. It's not hugely frothy right now, but there is weakness in the market," said Vazza. She advised investors to be "a little more cautious" and consider going "up the credit quality" ladder before making risky bets on junk bond issuers. Vazza also anticipates more volatility as the Federal Reserve signals its first interest rate hike in more than a decade. For the first time since late 2009 roughly 20% of junk bonds are now considered distressed, according to S&P. It defines that as junk bonds trading 10 percentage points above U.S. Treasuries, which are thought to be virtually risk-free. 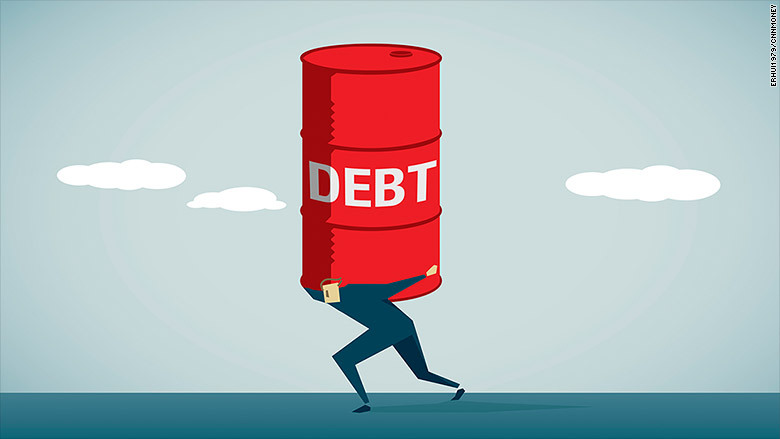 Not surprisingly, many of those distressed bonds were taken out by commodity producers that are now struggling with depressed oil and metals prices. The failure for oil prices to rebound puts immense pressure on companies that got a one-year lifeline from the bond market in recent months. "Next year is when you'll see the wave of defaults. Companies got financing, but will have burnt through it," said Colas.